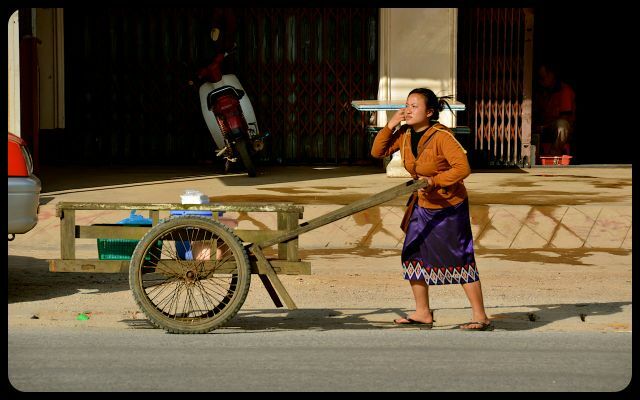 One detail that I enjoy immensely are the classic Laotian skirts or sinh. 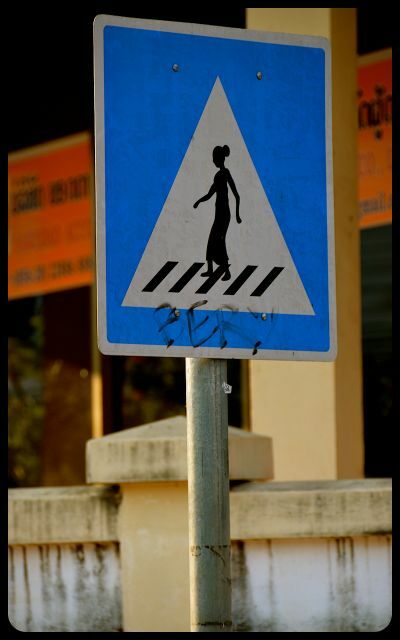 Sinh spottings are a bit more frequent in the rural areas, but female urbanites in Vientiane also sport them. For more formal occasions, Laotian ladies pair them with a traditional blouse, though for everyday wear, a Western-style shirt is frequently worn. Designs distinguish various ethnic groups. 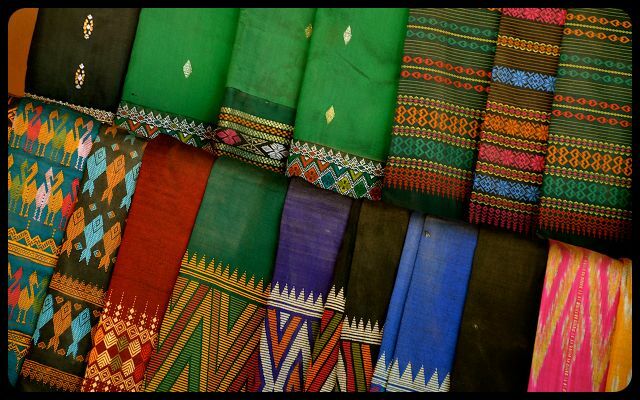 Traditionally, sinh garments were fashioned out of silk or a blend of silk and cotton. In past times, sinhs were only tailored on a loom, but today, mass-produced, synthetic knock-offs have seeped into Laotian marketplace stalls from China and Thailand. 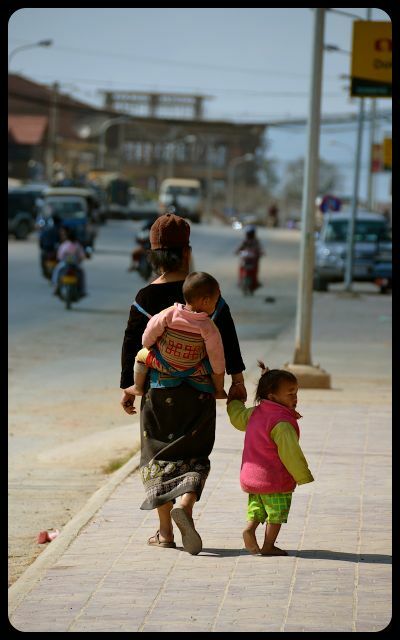 Still it’s common for Laotian girls and women, particularly in rural areas, to weave the skirt themselves. (As we traversed eastern Laos one late afternoon, just after crossing the border from Vietnam, we saw countless looms positioned in front of homes.) Young girls often learn by sewing the ornamental hem of the sinh first, then graduate to crafting the body of the skirt. With all these spectacular sinhs around I couldn’t resist dedicating a scarce corner of my luggage to bringing one or two home. The skirts are now even more international as I had them tailored and shortened in a small town in India. When I wear them, I think of wonderful days – not rushing – in lovely Laos. In the market for a sinh? If travel to Laos is not in your plans, the silk skirts are easily found online – but offered at considerably higher prices. If you’re headed to Laos, do opt to purchase in a fair-trade shop or collective, or directly from a merchant. My first purchase came at the non-touristic Phonsavan market in northeastern Laos. The young woman working at the market stall, a tiny baby slung across her back, did not speak any English. My Laotian was also lacking (limited only to the basic sabaidee – hello and khawp jai lai lai – thank you). Nevertheless using gestures befitting cavewomen, we successfully navigated the transaction and I became the proud owner of a radiant red sinh. 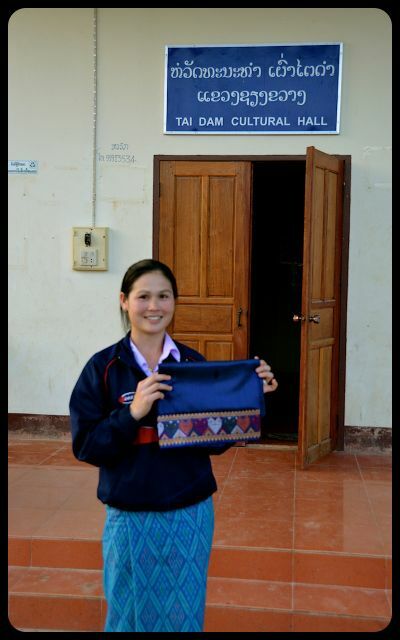 I purchased the deep blue silk skirt (above) at a cultural center in Tai Dam, Laos. The skirt was made by this young woman’s mother and proceeds went to a collective. Certainly, memories are most often the best souvenirs, but have you brought back any special trinkets from your travels that have a unique story? Wonder if they do one in my size? Sorry thinking out loud, I do try to bring my wife back some bits of local clothing from my travels. I have learned something new today, and in the nicest possible way :). A lovely photo essay about an appealing tradition. In answer to your question, I thought straightaway of our trip to Utah. Driving from Monument Valley to Moab we took a short detour and came upon an arts co-operative selling Navajo crafts. It was so far removed from the highway that I couldn’t imagine many casual tourists doing the four corners drive would have found it. My daughter and I bought some simple threaded beads which we still share and enjoy today. Many thanks for sharing your experience, Rachael. 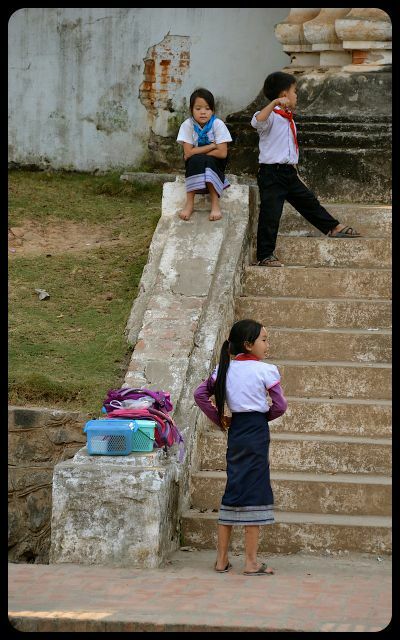 After yesterday’s rather somber posting I wanted to offer something more upbeat from Laos. It really is such a tremendous country. I cannot remember if you and your husband made it there during your Asian adventures? Your backroads journey through Utah sounds quite relaxing. Again, you’re making me want to explore more of the United States! I’m finding that jewelry (particularly those hand-made pieces) is really one of the best material souvenirs because it takes up limited space in the home. :) In the past years I’ve become a charm bracelet aficionado. Perhaps your Navajo beads can be inspiration for one of your future macrophotography postings! I hope you picked out a nice traditional one for yourself. Are the patterns also unique to each region? Are they printed of woven? I didn’t see any printed ones in Laos; the traditional sinhs that seemed to be the most common are woven on wooden looms but there are a large number now being commercially-produced and imported into Laos. In India and Indonesia we saw lovely block-printed and batik work. though. So many beautiful items – it would be wonderful to help support these talented artisans and get their work out to the masses. I’ve never understood how the women fasten them so tightly? I can’t get mine to stay on very long. Hi Callie, in which city did you buy your sinh? I can see how it’d be challenging just wrapping the skirt and expecting it to hold! Did you have yours tailored in Laos? I didn’t get a chance to do so there, but the tailor in India sewed a discrete button on mine. I do remember some Laotian locals telling me that it was customary to sew a little loop and hook at the top of the skirt. Your wardrobe must be pretty eclectic, Tricia. I was just reading about the dirdnl skirts too. The work that goes into weaving a Laotian sinh is incredible. I bought the sinh fabric in Laos, and actually had it cut into a western-style skirt in India. The Indian tailor was such a kind gentleman, and that skirt has a fun story. Do you tend to pick up any trinkets on your travels? I must admit that I’m a reformed shopper now, and try to only go for useful items like clothes (plus a charm for my vintage style charm bracelet). Hi all! My boyfriend brought me a Sinh from Lao, ..but I can’t figure out how to wear it… could you help me? thank you! Hi Alice, how nice of your boyfriend to bring back this traditional Laotian item for you! I’m pretty sure they’re mostly sold as fabric, and then you must get it tailored. When I bought my first sinh, I assumed I could just wrap it, but realized it would look like a potato sack and wouldn’t fasten without the tailoring. :) Traditionally, I think the seamstress sews a fastener inside, allowing one to wear it a bit like a sarong or tube skirt (it fastens inside, then you button the outside panel). I had mine tailored in an untraditional way. When we headed to India, after Laos, an Indian tailor sewed it into an A-line skirt, that fell just around the knee. As you can see from these pics, it’s traditional for the Laotian ladies to wear theirs just above the ankle. Hi, I’m going to Laos soon and would love to buy this skirt. I was wondering what the market price is (preferably, if you know how much the locals buy it for)? Is Vientiane a good place to buy it or would I be able to get one down south too? Hello Ivana, how fun that you’re headed to Laos soon. I hope that you’ll enjoy the country and meeting the people as much as we did. I’m not an expert on the prices for the Laotian skirts. Ones made out of synthetic materials went for a few US dollars, whereas the silk one that I purchased was probably $20 or less. There’s much work involved for the ones that are woven by hand! I didn’t purchase mine in Vientiane, rather in Phonsavan, and an outlying village (at a cultural center). I didn’t price them in Vientiane, so I’m not sure how the prices would compare. Help! My daughter flew in from Thailand and Laos yesterday. She brought two beautiful pieces of fabric from Lao and said she needs me to make them into skirts. I see that they wrap and I think I understand from previous posts that the ends overlap and fasten but is there anything else done on the top waste edge? It seems like it needs more fitting. Please advise this drafted tailor. Garla, I wish I could help you more with your tailoring question! I am not gifted in the art of sewing, so I’m not sure how it’s traditionally done, but I agree that it seems something’s sewn in to make it more fitted. I’m wondering if one of the online merchants selling authentic fabric from the region might be able to help you? Leigh, thanks for taking the time to share the sinh pattern here. Though I’ve not yet learned how to sew, I suspect it’ll be of use to other readers making their own sinh skirts. Have you also spent some time in Laos? I am interested in the skirt pattern. I don’t understand how it is cut on the fabric. Heather, what adventures you must’ve had calling Laos home for a year! Where did you live? My husband and I enjoyed Luang Prabang and Vientiane, but had some of our more meaningful experiences in and around Phonsavan. What additional spots would you recommend? 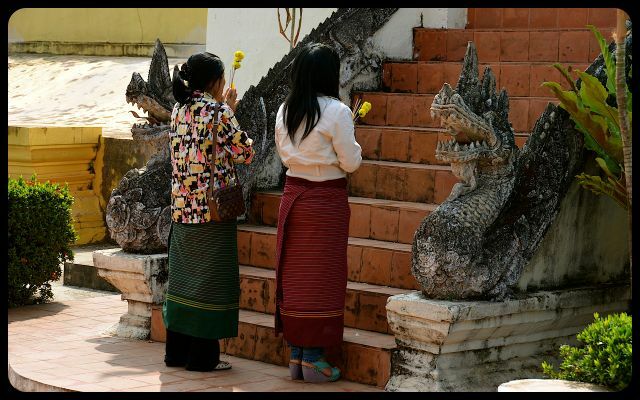 I bought the sinh in Laos but wasn’t able to have it tailored into a Lao skirt. I’m living in Việt Nam. How did you go about explaining to the tailor in India how to sew the sinh? I guess it helped having an already made skirt? I’m struggling to find patterns online to show the tailor. Any help will be greatly appreciated. Where do you live in Vietnam? I was last there in 2012, and hope to get back and do more exploring! In India, I actually had my skirt tailored twice. The first time it came out too poofy, so I asked the tailor to tweak it a bit. Fortunately, I’d befriended a woman who helped me translate with the tailor the second time around. The tailor didn’t mind, because I paid him for both renditions of the skirt. :) I didn’t have the skirt tailored in the traditional Laotian way though — mine is more A-line and hits around the knee. Perhaps you could find a photograph of your desired look and share that with the Vietnamese tailor? Up above in the comments, a reader has also shared a link to the pattern she used, but those instructions are in English. Good luck! Thank you Tricia. I will look for the comment. I know a tailor that understands English. I’m staying in HCMC but have explored a lot of Vietnam. It is definitely a gem. You’re welcome, Esneri. Agreed that Vietnam is a dynamic place. Since you’ve done a lot of exploring there, are there any spots in particular you’d recommend? We were thinking it might be rewarding to teach English there someday. There is a really good blog specifically about Vietnam that I can refer you to but not sure if you’d liked me to do that on your comments section. My favourite thing to do is to go on motorbike trips around Vietnam. Some of my favourite places are Da Lat, Hai Giang, Phu Long, Phong Nha – Ke Bang National Park and Hue. The tourist hot spots however are Ha Noi, Sa Pa, Ha Long Bay, Ninh Binh, Hue, Hoi An, Da Nang, Phu Quac, Mekong Delta and Sai Gon. I’ve been to all of them and they are definitely worth a visit. Recommended places that I still want to visit are Con Dao and Dac Lak. During bike trips you also get to visit small rural Vietnamese provinces and towns which are also amazing to see and stay in. I’m currently teaching in Sai Gọn and would encourage anybody to do it. Esneri, belated thanks for all these tips! We worked our way from Ho Chi Minh City all the way to Vinh, where we crossed into Laos. Still, we only saw the most popular spots (Hoi An, Da Lat, Mui Ne, Hue, Nha Trang, etc.) I’d love to explore some of the rural Vietnamese provinces that you mentioned, and I’ve made note of your recommendations.